Ideal for developing baby's motor skills and stimulating awareness! Baby can use this tunnel to crawl, hide and tell lots of stories along with Sophie the Giraffe and her friends: Lazare the Cat, Margot the Turtle, Kiwi the Bird, Joséphine the Mouse and Gabin the Bear. The attractive design fits nicely in baby's room, the dining room or the garden. Smart feature: A net window to reassure baby and parents. 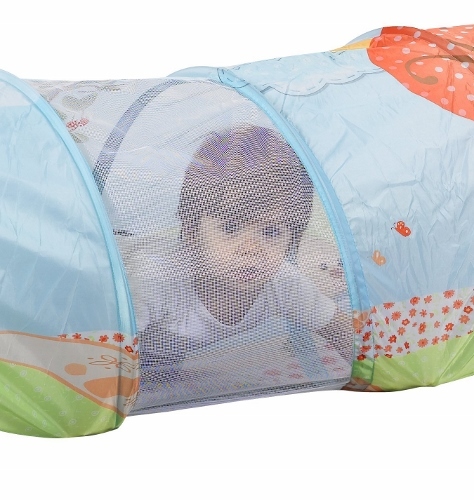 Thanks to the pop-up system, this tunnel can be folded up and stored in just a few seconds in order to follow baby's every movement.